3-month-old puppy found in an airport bathroom next to a heartbreaking note. 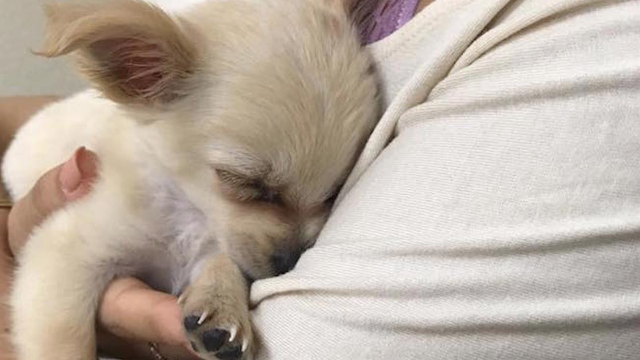 The story of a three-month-old Chihuahua puppy abandoned in an airport bathroom is going viral because of the note the former owner left with the pup, explaining the heartbreaking reason she had to leave him behind. According to Connor and Millie's Dog Rescue (CMDR), the puppy, whose name is Chewy, was found in a bathroom at McCarran International Airport in Las Vegas. Hi! I’m Chewy! My owner was in an abusive relationship and couldn’t afford me to get on the flight. She didn’t want to leave me with all her heart, but she has no other option. My ex-boyfriend kicked my dog when we were fighting and he has a big knot on his head. He probably needs a vet. I love Chewy sooo much – please love and take care of him. Chewy is now at with CMDR in Las Vegas, where he's reportedly doing completely fine. It's wonderful that his former owner was brave enough to leave the abusive situation she was in, and she must have been so heartsick having no choice but to leave her beloved Chewy behind. Aw, Chewy is such a sweet lil' pup! According to CMDR's Facebook page, there's been a ton of interest in little Chewy, so he'll find a home without a problem. In a recent post, the dog rescue wrote that they're going through all the requests from people looking to adopt Chewy, and are very thankful people care so much about this little puppy. There are a lot of comments suggesting that Chewy could maybe be reunited with his owner, but it's doubtful that will happen. In the same post, CMDR wrote, "However, there is but 1 Chewy and he can go but to 1 home." Please consider the hundreds if not thousands of "Chewys" loaded with love that are desperately seeking homes in shelters which are at max capacity, rescues are full! Please consider adopting another wonderful companion in his honor! They too were a Chewy : they've lost their home through no fault of their own. Life is tenuous in a shelter, lonely and the days seem endless in a cage. Not everyone can have Chewy himself but they sure can save another just like him and gift that furbaby a life! Just because the other dogs' stories haven't gone viral doesn't mean they aren't just as cute, sweet, and deserving of a safe, loving forever home.